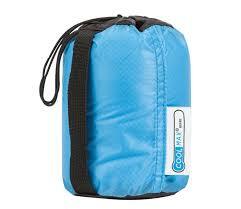 Sleeping bag liners pack so incredibly small that they make it wonderful to travel with. I used mine as I traveled on MegaBus to Atlanta, Dayton, Detroit, and San Francisco; on the plane from Chicago to Minneapolis to Seattle; and it was always there if I wanted to take a nap in the car that I took to Eugene, Coeur d’Alene, and Portland. That extra warmth can be critical to the comfortability that allows me to fall asleep with ease. As I traveled, I stayed in homes of friends and family, but I also stayed on the couches of people I didn’t know. That’s right, I used Couchsurfing to stay with people I’d never met before. This became important in case I was sleeping at a place that I didn’t feel like the couch or bed was particularly clean. That didn’t particularly happen, but I did use it with added peace of mind. These bad boys come in all shapes and sizes so you can customize them for exactly what you need. Because I tend to sleep pretty hot and am based in Florida, I got a thin cotton liner. To be flexible, I am just prepared to throw a jacket and pants on if I’m feeling particularly cool/cold. Not only did I use the liner for a blanket that warmed me on beds, couches, and in chairs while traveling, but I also used it as a pillow. It worked great whether I was in a hammock, or sleeping on one of those beds or couches. Oh yeah, and these things work really great when you use them to actually line your sleeping bag—adding a few extra degrees and level of comfort to your nightly sleep while on the trail.